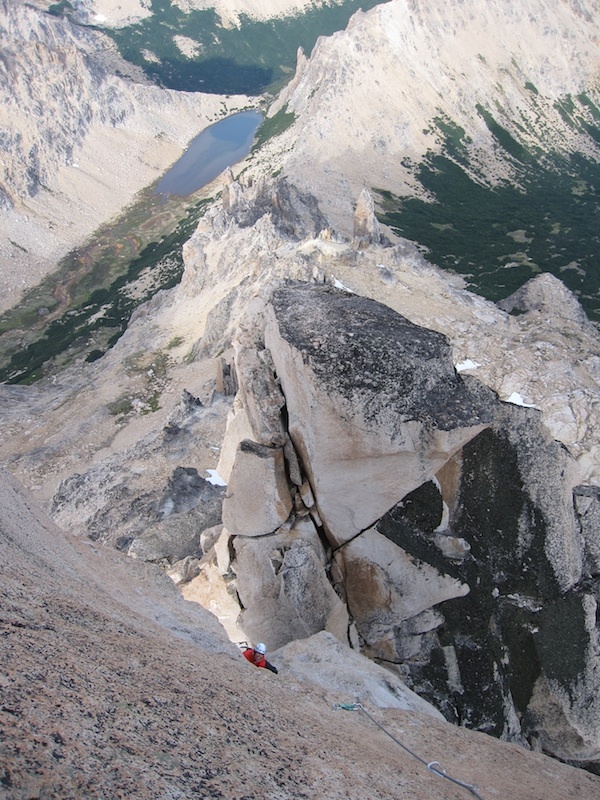 Morgan Boyles nearing the top of Siniestro Total, on Aguja Principal, Frey, Argentina. A lot of things can keep you from getting benighted, stuck huddling with some slovenly dude for warmth on a godforsaken ledge in the middle of nowhere. For one, you could stay home. But otherwise, speed rules. (Unless you’re bouldering, in which case it’s all about bongo drums and the bong taking long enough rest periods to maximize ultra-crushing-power [say it with an Arnold accent].) Finishing big routes before dark isn’t always about climbing fast, but about climbing efficiently. A lot goes into this, and maybe I’ll babble more in future posts, but one of the simplest ways to speed-up multi-pitch climbs is through efficient belay transitions. And one of the single biggest time-savers comes from using a simple piece of gear: an auto-blocking belay device, like the Black Diamond ATC-Guide or the Petzl Reverso. It’s hard to imagine why anyone would climb a multi-pitch route these days with a regular tuber or figure-8. Auto-blocking devices, an evolution from plaquettes or “magic plates” previously used mostly by savvy climbing guides to manage multiple clients, absolutely rule. They’re exponentially more efficient, addictively so (I haven’t used a non-auto-blocker on a multi-pitch climb in over a decade). They’re safer, too. They rappel and feed-out rope to the leader like normal, but, when configured correctly, they automatically lock-down if the second falls. Magic. The only downside is that when it locks on itself (if the second falls), letting out slack or lowering someone (which you rarely do on multi-pitch climbs) is a minor hassle – read-up on how to do it in your gear’s instruction manual (here’s a video). Also, since you’re belaying directly off the anchor, obviously the anchor must be bomber. In some sketchy situations (like alpine mixed climbs, to be redundant), your stance might be part of the anchor, in which case you’re belaying off your waist. Important: when belaying a leader, it’s business as usual – kind of like the “business in the front” part of a sweet mullet. 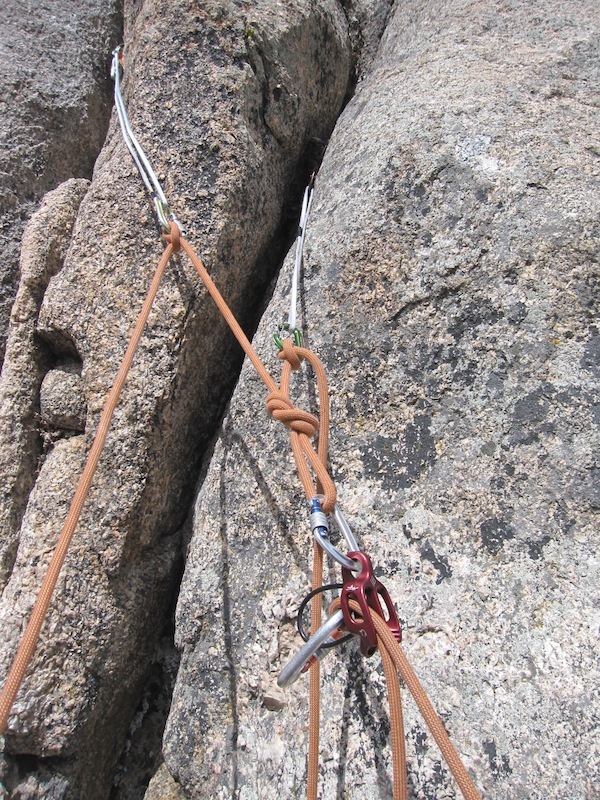 These devices are not like Gri-Gris, which aren’t appropriate for most multi-pitch trad climbs (they’re too heavy, lock up too statically, and they don’t rappel easily – though if you know how, you can get clever and do single-strand raps). You still have to keep your hand on the brake when belaying the leader. Killing your partner is extremely poor form. The magic of an auto-blocking belay device, in action. • Clip your auto-blocking belay device directly into the power point with a locker, pull up the slack, and put your partner on in auto-blocking mode. It’s not rocket science, but if you configure it backwards your second will deck if she falls – same as any belaying mistake. So tug the second’s strand as a quick test to be sure it locks. • Call “on belay” to your second. Then pull on your jacket, eat, drink, take a leak, organize the rope and gear, whatever, multi-tasking as you belay. Unless your second is constantly moving, you can – and should – do all these things in quick bursts, when you’re not pulling in slack. Time-honored, safe, and super efficient. If the second falls while you’re drinking Kool-Aid and waiting for the Rapture, the auto-blocker catches her. There you have it. An easy way, with a simple piece of gear, to help get your groove on. Even more, it’s part of the crucial un-benighted multi-pitch mindset: keep moving, think ahead, always be doing something. No spooning. It’s way better that way – trust me on this one.